I grew up in Chicago. I edged into distinct middle age in Chicago. I know the neighborhoods, streets and people of Chicago almost as well as my characters Abe Lieberman and Bill Hanrahan. My first short story, written when I was 13, was “Christ Lives in a Chicago Hotel.” It went unpublished. My favorite mystery writer when I was young was Thomas Dewey, a wonderful but relatively forgotten author who created a private eye named Mack who roamed the noir nights of the city I already knew so well. I wanted to write a Mack novel. Years later I was thrilled when Carl Kolchak, the night stalker, came to television and sloshed through the sewers, skyscrapers, museums, and graveyards of my city. The work of Barbara D’Amato, Hugh Holton, Sara Paretsky, and many others bring me back to memories of Old Town, Hyde Park, North Avenue, the Loop, Chinatown and the dark despair of the West and South Side inner city. My Lieberman novels probe the ethnic heart of the city. Haitians, Mexicans, Germans, Poles, Lithuanians, Indians (from India) spring to life as I write and remember the range of voices, the restaurants, the smell of each neighborhood, the looming dark churches. An experience I had in a crowded Chicago housing project led me to write a movie, Enemy Territory. All of my memories of the city are not affirmative but they are strong, real. I remember not being able to go one block south of the primarily Jewish ghetto in which my family lived on the West Side. To venture south of 19th street meant encountering the stares, warnings, and pushing of the Poles who protected their turf. I was beaten up by a boy named Willie who caught me taking a short cut through his neighborhood to get to a basketball game. When I was an adult, I was hit from behind with a Coke bottle while I was eating a hot dog at a counter. The assailant, bearded, insane, was quickly caught and could give no sane reason why he chose to attack me. All of this shows up in my work. I don’t want to get too poetic, but I’m writing about the city where my mother, son, granddaughter, sister, nieces, nephews, cousins still live. The lure of Chicago was so strong for my son that he left a more than good job as a lawyer in Rockville, Maryland, to return to the shore of Lake Michigan. I went to grade school and high school on Chicago’s tough West Side. Just writing this reminds me that my high school, John Marshall, was a perennial basketball power producing many college players, a good number of whom went on to the NBA. A story idea. Lieberman, who went to Marshall and played basketball, encounters a former player, tall, black, educated, and in trouble. Yes, I’ll use that. It will take me back to Kedzie Avenue and that massive, ancient red brick school. Memory leaps, ideas dance. Chicago inspires. Or how about this, Lieberman describes playing basketball against a much taller and highly aggressive Jesse Jackson at the University of Chicago gym. Lieberman wins. This is fiction. I did play with and against Jesse Jackson. He was far better than I. But Lieberman can win. In the Chicago I create, Lieberman can win. Even my new central figure who will appear shortly in a novel called Vengeance (Forge, September 1999) came from Chicago though he now lives, as I do, in Sarasota, Florida. Even Toby Peters found himself in Chicago in You Bet Your Life (1979). The power of the myth of Capone and Nitti made me take him there, walk down Wabash past Colosimo’s Restuarant which was still standing in 1942. It was torn down, I believe in the ’60s, but not before I got to see it. I worked off of 22nd Street, also known as Cermak Road, near Wabash. I was an office boy in a mob-owned company that made punch boards, those games of chance in which you paid your nickel or dime or even a dollar, and punched a piece of paper out of a round hole in the hope that you would unroll it and find that you had won twenty bucks. The punchboards were ingeniously hidden inside of fake cigar boxes, candy boxes, briefcases, books, and framed photographs for transporting over the Illinois border into every state in the union. Hey, yes, I’ll use that too. A young man who rises in the criminal world after starting as an office boy in… you get the idea. Chicago and my memories of it trigger my memory and imagination and always will. Stuart Kaminsky’s Lieberman series started with Lieberman’s Folly (IvyBooks, 1992). The Legend was born over a game of golf. Of course, like most legends, this one was conceived in real life, in heroic deeds performed, dangers courageously faced and overcome, principles of law defended, corruption withstood, and justice upheld. But it gestated for over two decades and was not actually born until 1955, on a golf course in New York, where a struggling businessman named Eliot Ness met a UPI sportswriter named Oscar Fraley. Ness was trying to persuade Fraley to buy stock in his paper company. Fraley wasn’t interested in the investment opportunity, but, over cocktails at the Waldorf-Astoria after the game, he was interested to learn that, prior to going into private business, Ness had been quite a big noise in the world of law enforcement. He’d been the leader of a special team of federal agents who’d helped put away Al Capone. Later, appointed Cleveland’s Director of Public Safety at the age of 34, he’d been the youngest major city police chief in the country. During World War II, he’d been head of the Federal Social Protection Agency, essentially the US government’s top vice cop, suppressing prostitution near military bases in an effort to keep sexually transmitted diseases from decimating the country’s armed forces. Warming to his subject, Ness regaled Fraley with thrilling tales of death threats, gun battles, one-way rides, and late night stakeouts. Five hours later, the veteran journalist was convinced that Ness’s exploits would make a hell of a book. A book on which he’d be glad to collaborate, if Ness was interested. Ness provided Fraley with a short written account of his part in the Capone investigation, along with boxes of newspaper clippings, case files, financial reports, and other souvenirs of the period. Fraley slowly fleshed this material out into a book-length manuscript, The Untouchables (Messner, 1957), which appeared some two years after that fateful golf course meeting. The Legend was still in its infancy. Contrary to subsequent reports, the book was not an immediate best-seller. Initial sales were respectable, but hardly spectacular. One of the people who did read it when it first came out was a television producer named Desi Arnaz. Arnaz, known to America as “Mr. Lucille Ball” for his portrayal of bandleader Ricky Ricardo on I Love Lucy, was the business genius behind the success of Desilu Productions. He was trying to branch out from situation comedies and had convinced his network, CBS, to schedule a dramatic anthology series, Desilu Playhouse, for the 1958-59 season. Sponsored by Westinghouse, this was to be Arnaz’s bid for the kind of prestige and critical acclaim routinely garnered by shows like US Steel Hour, Hallmark Hall of Fame, and Alcoa Hour. Arnaz thought that The Untouchables would be perfect as an entry in this new venture. Indeed, if he stretched it out into two one-hour chapters, he’d be able to sell it abroad as a theatrical feature film as well as a domestic TV production. He immediately secured the rights. Airing late in April 1959, The Untouchables was a national sensation, prefiguring the kind of coast-to-coast attention that would be paid to such later broadcast “events” as the final episode of The Fugitive, the “Who Shot J.R.?” sequence on Dallas, and serialized TV-movies like Rich Man, Poor Man or Roots. One of the people who took note of the national Ness craze was the president of ABC, who contacted Arnaz and suggested that a series about Ness and his squad be developed. The Legend was reaching full maturity. CBS, the network on which Ness had been introduced to a soon-to-be-adoring public, had been snookered. In effect, they’d aired the pilot for a series that would debut on a competing network the following fall. Stack was kept on as Ness, of course. Bruce Gordon, as Capone’s still-at-large right-hand man, Frank Nitti, was also persuaded to continue. Gossip columnist and radio personality Walter Winchell, who’d added a touch of period authenticity as the narrator of the pilot, would serve the same function in the series. Aside from Stack, the only other returning Untouchable was Abel Fernandez as Bill Youngfellow (the fictional analog for real-life Agent Bill Gardner). Other members of the squad were either re-cast or dropped from the roster altogether. Ironically, Nicholas Georgiade and Paul Picerni, who’d played swarthy Mediterranean hoods in the pilot, wound up playing swarthy Mediterranean Feds in the subsequent series. An immediate critical and ratings hit, The Untouchables television series was also an immediate controversy. In its four years on the air, the show would be accused of anti-Italian bias (in fact, the Italian Anti-Defamation League was formed in response to this show), of engendering violence (forty years later it’s still one of the most violent shows ever broadcast), and of playing fast and loose with the facts. This last accusation was not unfounded. The pilot had pretty much stuck to history, but it ended with Capone being jailed, which left comparatively little real life on which to base the subsequent series. And the longer the series lasted, the farther from real life it strayed. No longer merely an operative of the Justice Department’s Prohibition Bureau, as he had been in real life, in the book, and in the Desilu Playhouse presentation, Ness was now referred to as simply a generic “Federal Agent,” an all-purpose investigator who not only knocked over breweries and speakeasies, as the real-life Ness did, but was in charge of cracking any kind of crime whatsoever that the US Government might take an interest in. In the course of the series, Ness would tangle with such diverse federal offenders as narcotics traffickers, interstate truck hijackers, bank robbers, white slavers, postal train robbers, counterfeiters, kidnappers, and even, in one fanciful episode, Nazi spies. And, as if getting Capone wasn’t enough, the series would credit Ness with ending the careers of Ma Barker and her boys, Dutch Schultz, Walter Leganza, Mad Dog Coll, and Legs Diamond, among many others. When the writers ran out of real-life bad guys to pit against Ness, they simply started making up fictional ones. The Legend was being transformed into Myth. Stack’s tough, flinty performance as the no-nonsense Ness is what most people remember from the series. Indeed, to this day, Stack is Ness to most people. It’s hard to recall that he started his career as the boyish romantic lead in movies like First Love or To Be or Not To Be, so identified is he with hard, taciturn crime-busters. In fact, his Ness was so definitive that he’s been saddled with the image ever since, spoofing it on programs like The Lucy Show, or, essentially, repeating it in later series like Most Wanted (in which he played a tough, incorruptible policeman who commanded of an elite squad of special investigators), Strike Force (in which he played a tough, incorruptible policeman who commanded of an elite squad of special investigators), or The Name of the Game (in which he played a former federal agent who’d left law enforcement to edit a true crime magazine; Eliot Ness as journalist). As the host of Unsolved Mysteries, he continued to trade on his Ness image, introducing stories in the same clipped, macho tones he’d used decades earlier to announce that some born-sorry scum was under arrest. In 1991, he finally surrendered to the inevitable and, in a made-for-TV “reunion” movie entitled The Return of Eliot Ness, he resumed the role that he’d made famous. That he’d made Legendary. With the Legend now in full swing, Ness began to appear in other media. Comic books, board games, bubble gum trading cards, all cashed in on the famed gangbuster’s notoriety. Desilu stitched together two-part episodes of the series and released them to theatres as feature-length films. Paperback reprints of the book finally achieved the best-seller status that eluded the hardbound edition, and Fraley cashed in on the success by writing two more volumes about Ness, Four Against the Mob (Popular, 1961), detailing Ness’s later career with the Cleveland Police, and, in collaboration with former Ness staffer Paul Robsky, The Last of the Untouchables (River City, 1962), re-telling the story of the government’s war against Capone from the point of view of one of the foot-soldiers rather than the general. Ironically, Ness, who, during his crime-fighting days, had so savored personal publicity that mobsters derisively referred to him as “Eliot Press,” never got to enjoy his renewed fame. He died suddenly in 1957, just weeks before his book appeared in stores. The series remained immensely popular in syndicated reruns, and, in the mid-80s, when Paramount Pictures (which had taken over Desilu in 1967) reviewed its properties to see what might be ripe for film development, The Untouchables suddenly seemed just the thing on which to build a big-budget movie. Brian DePalma was slated to direct, and Pulitzer Prize-winning playwright David Mamet was hired to write the screenplay. But who would play Ness? As the project worked its way through “development hell,” a number of possibilities were mentioned, including Mel Gibson and Kevin Kline. But nobody the producers could think of seemed capable of erasing Robert Stack from the public memory. Ultimately, it was decided that, rather than trying to recreate the Stack characterization, an actor should be cast who could strike an entirely different note. Kevin Costner, the young actor eventually hired to portray the ace investigator, did just that. The script depicted Ness as a somewhat callow youth, inexperienced in the real world of rough-and-ready police work, easily shocked by the casual corruption he finds in Capone’s Chicago, easily duped by brother law officers on the Outfit’s pad. This Ness is a novice who must learn the ropes before making any headway against Capone’s organization. Sean Connery was cast as Jim Malone, a veteran, street-smart beat cop who signs on as a federal agent and becomes Ness’s mentor, teaching him those ropes. This role that would win him an Oscar. Robert DeNiro made a memorable Capone, who, though on screen for less than ten minutes, seemed to dominate the entire movie. Andy Garcia and Charles Martin Smith filled out the rest of Ness’s squad. Retired Special Agent Al “Wallpaper” Wolff, the last surviving member of Ness’s real-life team, was hired as a consultant. He advised Costner that Ness was “passive,” and that’s how Costner played him. Far from the steely avenger portrayed by Stack, Costner’s Ness is almost bashful. Caught between the bravura performances of Connery and DeNiro, Costner underplays so much that he almost seems to disappear. And the portrayal of Ness isn’t the only way the film diverged from the TV series. Colorful, and filmed in color, where the series was atmospherically noir, and filmed in black and white; epic, indeed almost operatic, where the TV series was gritty and claustrophobic; filmed on location where the series had been studio-shot; DePalma seemed to be almost deliberately avoiding any similarities with the film’s television source. The film goes from merely being poorly researched to downright ludicrous, bordering on surrealistic, during the scenes depicting Capone’s income tax trial. Juries are switched in the middle of trials. Juries hear divorce cases. And they hear them in federal courts. Capone’s lawyer pleads his client guilty, and the plea is accepted over the defendant’s violent protests. A judge who, in real life, had a well-deserved reputation for probity and integrity, is depicted as a venal grafter. As annoying as these discrepancies are to me, I do have to confess that I love the film. For all its flaws, it’s grand entertainment, masterfully helmed by DePalma. And, while I personally found Costner’s performance as Ness lackluster, it must be admitted that the role did catapult him to stardom. The Legend now had alternate interpretations. Like the TV series, the film was a big success, both critically and commercially, and like the TV series, it spawned a new cycle of Ness-related products that kept Chicago’s most famous Fed in the public eye. Mystery writers like Max Allan Collins wrote novels fictionalizing Ness’s real-life cases. Robert Stack resumed the role in the previously mentioned TV-movie. All of Fraley’s Ness books were reprinted, yet again. TV documentaries attempted to separate the facts of Ness’s life from the fiction. Journalist Paul Heimel did the same thing in a newly-published biography entitled Eliot Ness—The Real Story (Knox, 1997). The Legend gained renewed strength. And before too long there was a second TV series. Syndicated to local stations, this new version of The Untouchables debuted in 1993 as part of a package deal with Paramount’s latest Star Trek spin-off, Deep Space Nine. It tried to synthesize the best elements of the earlier series and the 1987 film. As in the series (and real life for that matter), Ness recruits his staff through careful examination of their backgrounds. As in the film, the new show was shot on location in Chicago. As in the series, many of the new TV Untouchables were based on real-life counterparts. As in the film, the most prominent Untouchable, save for Ness himself, was a totally fictional veteran Chicago cop turned federal agent named Malone (Welsh actor John Rhys-Davies taking over from Connery). Silhouettes of Ness and his men introduced each “act” of the episode, recalling the similar logo used in the original show. Ness’s main adversary throughout the run of the new series, as he had been the film, was Capone himself, rather than a rotating cast of revolving “guest villains” for Ness to contend with following Capone’s imprisonment. The new series began with Ness being assigned to get Capone. It ended with Capone’s conviction on tax evasion charges. As it progressed, the steady movement towards a defined climax gave viewers a greater sense of continuity than had been the case with the more self-contained episodes of the original show. The program was extraordinarily well-cast. Rhys-Davies’s Malone was every bit as interesting a character as Connery’s had been. William Forsythe portrayed Capone as an intelligent, articulate, often contemplative man, capable of engendering sympathy from the audience in a way previous Capone portrayers did not. This made his sudden outbursts of anger and violence that much more frightening. Paul Regina as Capone’s right-hand man, Frank Nitti, was neither the blustering, Damon Runyonesque character portrayed by Bruce Gordon in the original series, nor the almost supernaturally reptilian figure portrayed by Billy Drago in the film, but simply a cold-blooded, supremely competent business executive whose business happened to be crime. Other cast members included Valentino Cimo, repeating the role of Capone henchman Frankie Rio he had originated in the movie; David John Elliott as Ness’s wire-tap expert Paul Robbins (a fictionalized version of Paul Robsky); and American Indian actor Michael Horse as George Steelman (another fictional counterpart to real-life Ness team member Bill Gardner). The squad was filled out by John Haymes Newton and Shea Farrell. All handled their parts with professional competence. But the master stroke was casting a local Chicago stage actor, Tom Amandes, as Ness. Technically superior as a performer to both Stack and Costner, Amandes had the added advantage of a closer physical resemblance to the real-life figure than either of his predecessors. Tall, and slender almost to the point of gangliness, Amandes in a three piece suit and snap-brim fedora reminded one of a young James Stewart. He put this likeness to good use, managing to bring a Stack-like resilience and self-assurance to the Ness role, while still suggesting the kind of boyish idealism Costner tried to put across. With a fine cast, a lavish budget, and one of the most famous real-life duels between lawman and law-breaker from which to draw its stories, the new program seemed to have everything going for it. Everything but scripts. None of the episodes was badly written, and, in fact, some were quite good. But few had the spark and juice that a typical episode from the classic series had. And, though the producers bragged that “this time” more attention would be paid to historical accuracy, the new series was probably the most historically inaccurate version yet. Ness was, once again, incorrectly identified as a Treasury Agent, rather than as the Justice Department operative he had been in real life, or even as the vaguely defined “Federal Agent” he’d been in the original show. And, while that original series had broadened the scope of Ness’s jurisdiction for its fictional purposes, they at least made some effort to keep his activities confined to violations of US law. Amandes’s Ness had no such restrictions. If he felt like investigating it, he investigated it, whether it was a federal offense or not. In one episode he goes after a serial killer. In another after the murderer of a city cop. In a third, the machine-gunner of an altar boys’ Communion breakfast. A good question. Many of the writers of the original series (e.g. 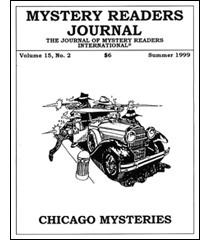 novelist W.R. Burnett, author of Little Caesar, 1929), had been there in Chicago while the real events had been going on, and, however much they may have embellished the truth for fictional purposes, their fiction was nonetheless informed by real life, a real life they had lived through. This gave even their scripts the bite of authenticity. The writers of the new show, on the other hand, seemed to have gained their knowledge of the period from movies. Indeed, where the original show would often take real-life events and fictionalize them by inserting Ness, the new series would adapt famous movies (uncredited) and insert Ness into the familiar plots. The aforementioned serial killer episode, a two-parter in which Ness and Capone agree to work together to nail a murderer preying on small children, was a remake of the famous German crime film M. An episode in which Capone has Ness kidnapped and brainwashed into thinking he’s been in a coma for five years so that he’ll reveal the whereabouts of crucial evidence, was easily recognizable as a rip-off of the 1962 espionage thriller 36 Hours. Other famous suspense films that inspired episodes of the new series included Laura, The Day of the Jackal, Stakeout, and Fatal Attraction. The Legend had grown beyond the proportions of mere Myth, and had attained the status of Pop Culture Icon. For some reason, she failed to understand the historical importance of this event.